Individuals can determine eligibility thereby reducing the number of initial contacts to Legal Aid staff. Wasted time costs everyone so its valuable for an individual who is seeking legal assistance to know what resources are available to them as well as which are not. As it is today individuals seek Legal Aid services only to find out that they do not qualify financially. This wastes not only their time but also that of the Legal Aid staff. Since the financial qualification component is fairly straight forward, providing this ability to individuals and community partners will provide the ability to determine eligibility before they contact Legal Aid services will reduce the workload of the Legal Aid staff. 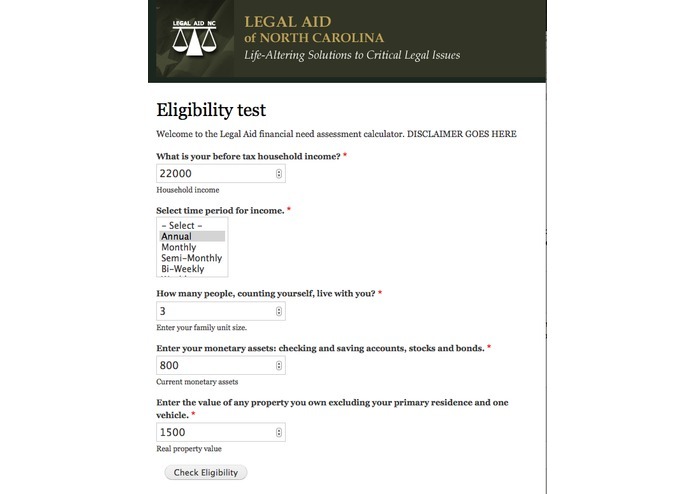 The Legal Aid eligibility test provides simple, easy to use, mobile friendly interface that allows individuals to answer a few questions and based on the responses determines if they meet the financial requirements. The eligibility test can also be access using voice prompts (under construction). It's build on a Drupal 8 platform and is a custom module written in PHP. Getting the interactive voice capabilities working turned out to be more challenging than expected. 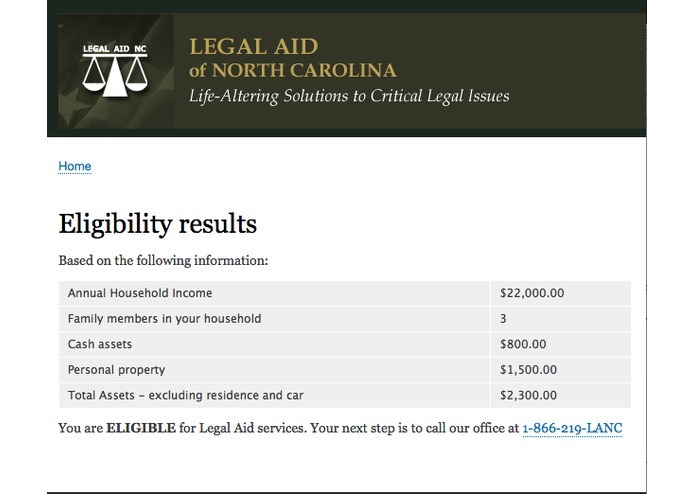 I was surprised to learn how difficult it is to qualify for Legal Aid services and how many "needy" people cannot qualify. I also learned how to create VOIP interactive scripts for the Twilio VOIP service. Complete the VOIP interface and then create an administration component so as financial requirements change they can be easily modified to reflect those changes.